This collection of simple gratitude activities for kids can be done any time of the year. During the holidays is typically when most people start thinking about thankfulness and gratitude. However, remembering to take time throughout the whole year to cultivate gratitude in the home is important. Below you will find lessons in gratitude, thankful activities, gratitude games, and gratitude crafts to help encourage and teach children about the concept of gratitude. Gratitude brings abundance. When we are thankful for what we have we are given more of what we are grateful for. Simple… but true. When we teach and model gratitude to our children it can help them find greater happiness in life. You will find that many of these gratitude activities were created around Thanksgiving and the holidays, but each one is not specific to the holidays. You will not find any Thanksgiving Turkey’s here. 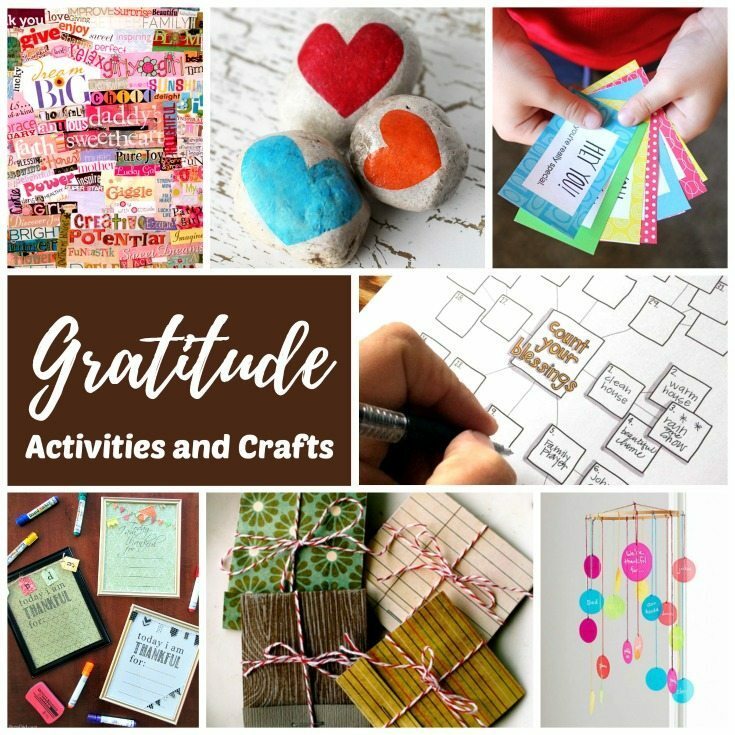 If you looking for gratitude activities to do on and around Thanksgiving, check out Thanksgiving gratitude activities and crafts for lots of fun ideas! Update: I have added a few new posts since I first published this article to include some other fantastic posts that I found. I will continue to update and add amazing resources to this list. Be sure you save it to your pinboard and check back regularly. I have marked (*) the articles featured in the images so they can be easily found. Click on the links to see the original articles. Use these simple lessons in gratitude to teach kids about thankfulness and gratitude. Try these 5 Simple Steps to Help Your Child Start a Gratitude Journal by Growing Book by Book for Lasso the Moon*. Print out some of these free gratitude free gratitude pie charts from Simple Inspiration* and write down of everything you have to be grateful for. Make one of the gratitude journals found in “Thankful Crafts” below, or download and print this free gratitude journal for kids from Money Saving Mom. Write thank you notes to share gratitude with people your children love using these free printable kids *coloring notes from A Girl and a Glue Gun. Create a simple gratitude wall like this one from What Do We Do All Day. Feel free to make it your own and embellish it in any way you wish. Print out this free *thankful dry erase board from Bren Did and hang it in a prominent place in the home. We have ours hanging in the dining room where we each share what we are grateful for at dinner each night. Have a gratitude photo scavenger hunt with your family from Let’s Get Together. Play a gratitude game with the kids to remind them of the many things that they have to be grateful for. You will love this homemade version of Pick-up Sticks with a gratitude twist by Teach Beside Me. Encourage the kids to be kind to nature and express their gratitude for the great outdoors by going on a thankful nature walk. Make your own personalized gratitude journals from The Chaos and the Clutter. Make a thank you bank like the one found on Tips from a Typical Mom to put on the wall and fill with everything you are grateful for. Then on Thanksgiving or Christmas, you can read the thankful notes from your gratitude jar. Make a kindness cootie catcher (or fortune teller) for the kids like the one found on Coffee Cups and Crayons. Make some thankful wind spinners like these from Make and Takes. Help your children make a thankful book inspired by this one from Mama’s Happy Hive. Make a sticky note door hanger so your kids can write something they are thankful for on the sticky notes that are attached each day from Parents Magazine. For a wonderful list of books that help nurture gratitude in the home year round check out Gratitude Books for Kids That Inspire Thankfulness. Nurturing gratitude in the home using these simple activities and crafts is something the whole family will enjoy. If you looking for gratitude activities to do on and around Thanksgiving, check out this awesome collection of Thanksgiving gratitude activities and crafts. Don’t wait… share your gratitude today! Click on the link to learn more about Rhythms of Play! Thanks, Boyd! I’m so glad that you found it useful!